He’s expected to be kept under house arrest with one hour of free time each day. OSCAR PISTORIUS is set to be freed on parole next week – after serving just ten months in jail. The decision has sparked anger among the Steenkamp family. Pistorius, who became a global star after competing in the Paralympics and Olympics, claimed he mistook his girlfriend for an intruder when he fired four shots through a locked bathroom door on Valentine’s Day in 2013. The 28-year-old athlete was found guilty last year of culpable homicide – a charge equivalent to manslaughter – and sentenced to five years in prison. “The Correctional Supervision and Parole Board… approved the placement of Oscar Pistorius under correctional supervision with effect from 21 August,” the government statement confirming his release said. However, the Steenkamp insist “incarceration of 10 months for taking a life is simply not enough”. We fear that this will not send out the proper message and serve as the deterrent it should. The statement added that the family had “forgiven” Pistorius and did “not seek to avenge” the death of their daughter. Zach Modise, commissioner of the correctional services, said Pistorius would likely be kept under house arrest with one hour of free time each day before the restrictions are gradually eased. Due to his physical disability, Pistorius has been held in the hospital ward of a Pretoria prison, shielding him from the often brutal overcrowded cells that are known for gang violence. State prosecutors are appealing against the athlete’s conviction for culpable homicide, saying he should have been found guilty of murder. An appeal hearing has been set for November. State prosecutors were granted permission to appeal against the verdict, arguing that the judge misinterpreted the law when she ruled Pistorius did not intentionally kill Steenkamp. 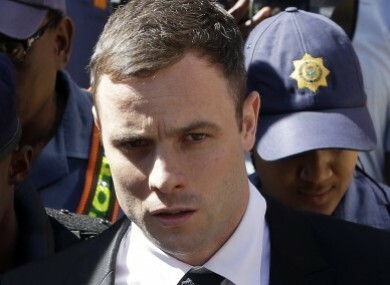 Pistorius’s legal team have unsuccessfully tried to halt the appeal – contending the conviction was based on facts presented during the trial and therefore cannot be challenged. If an appeals court finds him guilty of murder, Pistorius could face at least 15 years in jail. With reporting by © AFP, 2015. Email “Oscar Pistorius is getting out of prison next week - 10 months into his sentence”. Feedback on “Oscar Pistorius is getting out of prison next week - 10 months into his sentence”.